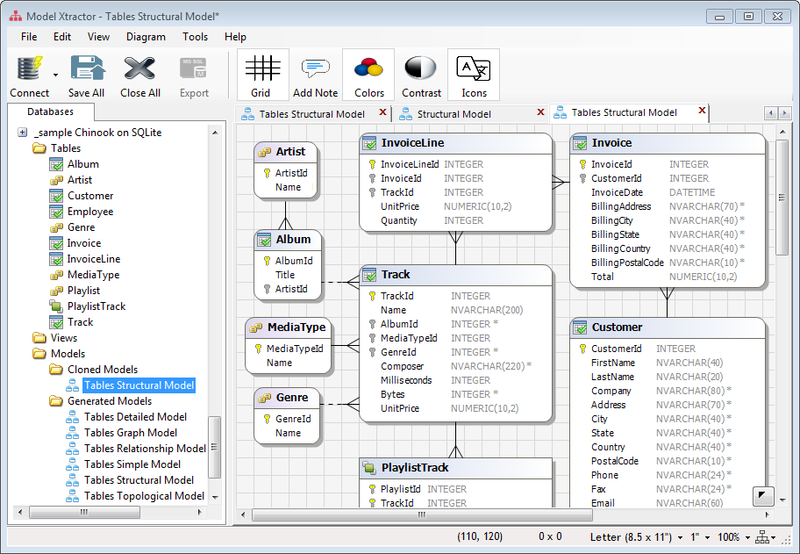 Generic relational database modeling inspection tool. For traditional or enhanced ER models, generated models or diagrams created from scratch, cloned and further customized, rich or simplified. One-time reverse engineer, to extract information about database tables, views, columns and relationships. Generic support for dozens of relational database platforms, including Oracle, SQL Server, PostgreSQL, MySQL, Azure, Amazon Redshift, SQLite and Firebird. Automatic or manual layout. Hide, collapse or minify table/view shapes. Bypass intersection tables and show conceptual many-to-many connectors between shapes. Capture one-to-zero/one relationships. Replace physical data types with short conceptual types (numeric, string, datetime). 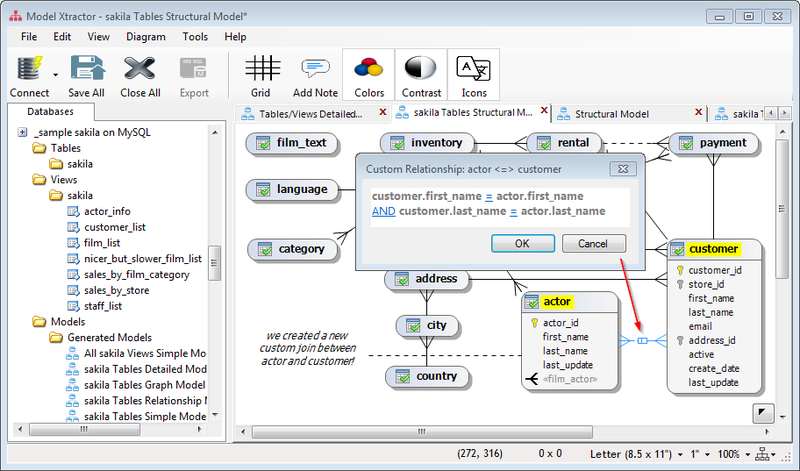 Customize a large number of rich generated models, such as the Detailed, Structural, or Relationships model here. Save diagram as image or PDF. Highlight shape titles and item names. Combine the reduced but powerful set of diagram options, to generate all sorts of effects. Customize your general settings. 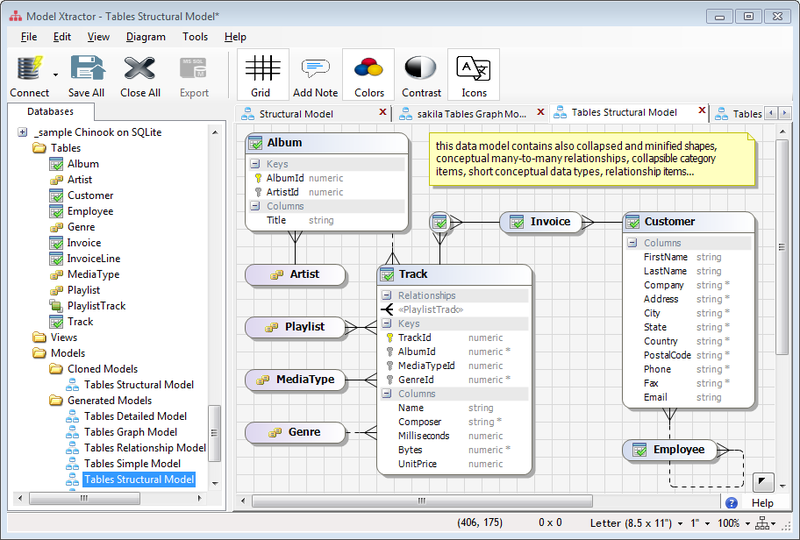 Customize a large number of simplified generated models, such as the Simple, Topological, or Graph model here. Shapes have been collapsed and rendered transparent. Connectors are straight lines and show no other details. These diagram types outline the degree of connectivity between tables, through relationships. Expand relationships into connectors with simple drag and drop of generated relationship items. Collapse connectors back by simply removing them from the diagram. Move the mouse over connectors, shapes and items, to highlight all related elements. Easily enhance your model with custom joins, without actually changing the connected database at all! Drag one table column over another to start creating a custom join. Enhance it by dragging another table column over another. Visualize and customize your linked columns. Built-in chains are automatically created for any many-to-many relationship, bypassing the intersection table. Easily create custom chain relationships, without actually changing the connected database at all! Create the chain from two or more selected connectors. 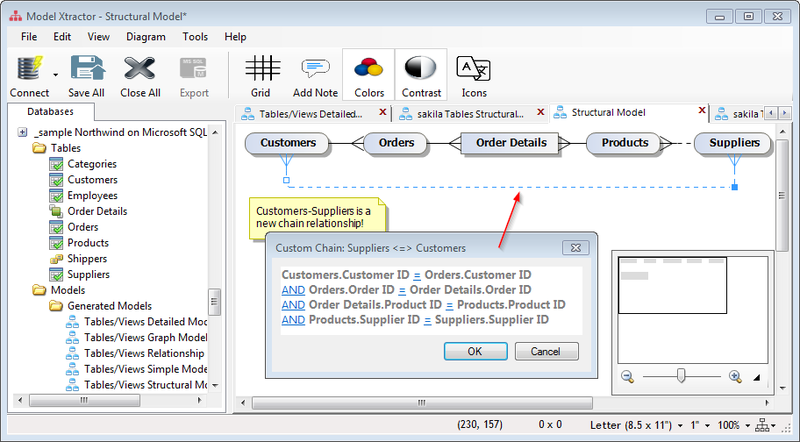 A new derived chain relationship appears here between Customers and Suppliers, to give you all suppliers who delivered the orders for each customer. Relationship Properties shows how individual join conditions of selected connectors propagated to define the new chain. Provide your own table and column aliases, and relationship names. 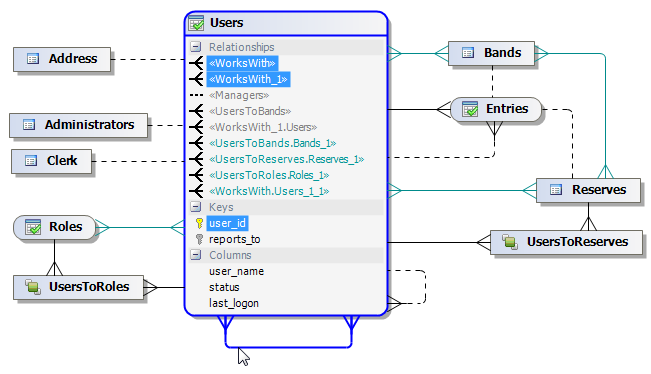 Alter your diagram views without actually changing the connected database at all! Instant propagation to all your objects, model diagrams and queries.